Brandon and Jerry share lessons learned from ultralight backpacking on how to declutter your mind. Many long-trail hikers, like those who hike the Appalachian Trail, enjoy going “ultralight.” To be considered an ultralight backpacker, one’s gear “base weight” (food, water, and cooking fuel are not included) is under ten pounds. The idea behind going ultralight is about carrying the lightest load possible to be able to hike as farther and faster than those who don a traditional pack that weighs two to three times more. It is a hiking philosophy that focuses on carrying only what you need and carrying items that perform a variety of functions. Every ounce of gear matters. Jerry loves to travel light in the first place. You will rarely find him taking more than a backpack for a three to four-day trip, and that includes both his clothing and what he needs for work. This allows him to travel faster. There is no need for checking baggage. No time is spent at the baggage claim. There is less stress because there is less stuff to think about. Coworkers were even more amazed in 2018 when Jerry traveled to his company’s headquarters with plans to camp during that trip and still be presentable at work. As a result of traveling light, he was able to enjoy one night under the stars with a lake view. He woke up watching a lightning storm in the distance. Less was more. Because he took the time to gain confidence in having less with him, he was able to enjoy more with what he had around him. When you get rid of your stuff you declutter your life, you declutter your mind. Research shows that stores that offer less variety make more sales of their products than stores that offer a wide variety of options. That seems odd for a society that prides itself on being unique and enjoying choices. Apparently, too many choices are too much on the mind. Maybe that is why animals travel in herds or packs. Too many choices clutter the minds of predators. 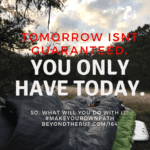 It is possible to apply concepts of ultralight backpacking to declutter multiple areas of your life. Take yourself through this “Declutter Your Life Checklist” through the next week, and see what it does for you. There are just a few questions to ask yourself as you go through this process. Have I actually used this in the last two to three years? No? Get rid of it. Does this item really bring value to my life? This one is trickier. A better way to ask it is does it enhance your life or it is a burden to keep it? Toss it if it is a burden. First, declutter a room in 30 minutes. Jerry applied going ultralight to his closet and bedroom first. Well, as much as his wife would allow anyway. He wound up getting rid of more than half his clothes. He did this for books and other items around his room. Mrs. Dugan was pleased afterward because it freed up a lot of space for what she wanted to do with the room. Win-win right there! Second, repeat that process room-by-room in the house. You’ll probably have the most items tucked away in your garage. When Jerry did this to his garage, he was amazed hat just about everything could go. His family was holding onto broken toys, broken bicycles they never ride, and items for a future garage sale. The funny thing is they don’t do garage sales! Third, apply this process to activities in your life. You may feel like you are stuck in a rut because there is little leisure time. You’re simply bouncing from one activity to the next. There are something things worth doing, and there are some things that simply do not bring value to your life or to the lives of others. Stop doing those things. Fourth, apply this process to your work or business. Are there meetings you attend that are doing nothing for the company’s strategic initiatives? How often do you hear someone defend pointless processes and tasks as “that’s how we’ve always done it?” Do you have boxes tucked away in storage that no one has touched in over a year? Be the brave soul who puts an end to those. Get rid of the stuff your company is holding onto and you will declutter your workplace enough to focus on what drives the business. Once you have decluttered your home and your life, let that be an end to your “keeping up with the Joneses” mindset. Try to live life like an ultralight backpacker for 30 days. Note how it declutters your mind once you’re done. As we say in the hiking world, “Hike your own hike!” When you’re not bogged down by a heavy pack on the trail, you’re able to enjoy every vista, every meadow, and every Kodak moment. In a sense, you have decluttered your mind from worrying about how heavy your pack is. 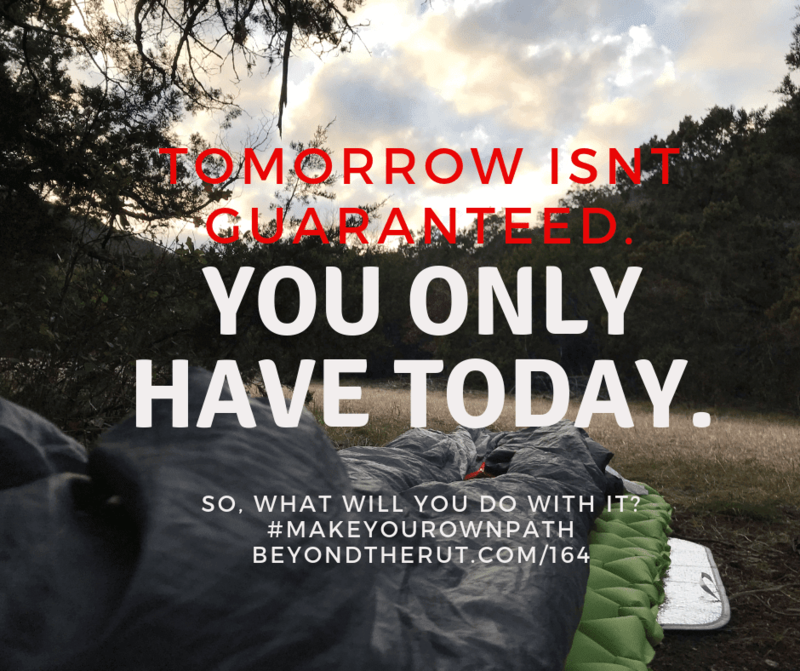 Imagine a life Beyond the Rut where you have lightened the pack you carry on your shoulders.